Do You Have Dinosaur Teeth? Sure, us Humans may only have two sets of natural teeth that are produced over the course of our entire life, but dinosaurs, particularly the Tyrannosaurus Rex, had many. 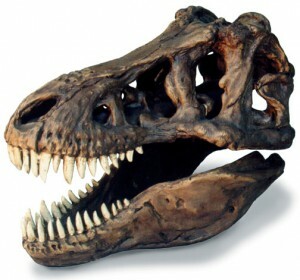 A fascinating fact: the T-Rex actually produced a new set of teeth every year! 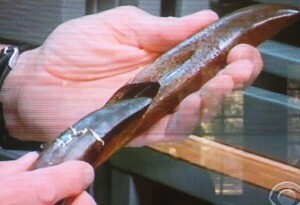 60 Minutes recently featured a headline story entitled "B-Rex" which contained information about the teeth of dinosaurs, specifically the T-Rex. The new teeth in the dino would grow directly beneath the existing teeth, similar to how our permanent teeth develop beneath our baby teeth. Wouldn't it be nice to have a replacement tooth grow automatically whenever we have a problem?! Earlier this year, researcher and long-famed paleontologist Jack Horner had uncovered "B. Rex," a 68-million year old T-Rex that is giving the academic community a lot to think about, both relating to dinosaurs and to the use of tooth material (and other mineral matter) in fossils. Through a special process of acid dissolution of ancient dino bones, organic material – blood vessels – were extracted and found in near-fresh condition! "[We] dissolved away pieces of an even older dinosaur – a well-preserved 80-million-year-old duckbill – in acid, and again, found what appear to be blood vessels." With this matter, new creatures could be genetically grown that had fallen extinct millions of years ago – a dino zoo even! What is interesting about dinosaur teeth however is that they illustrate how versatile teeth are in Earth's many different life forms. Humans obviously use their teeth for tearing, chewing and start the process of digesting food; speech and aesthetic purposes are also served by our teeth. Although we only have two sets of natural teeth, we can artificially create new teeth with implant dentistry. Other creatures have no teeth, like ducks and geese, which simply use their bill to seek out food and begin the digestion process. The systematic replacement of old or broken teeth in dinosaurs is what's driving research that will hopefully, in the future, result in human teeth being grown for human tooth replacement. Imagine being able to have a real, natural and healthy tooth installed in your mouth! A new tooth is ready to replace the existing T-Rex tooth! fixture, replacing a tooth's root being implanted in the jaw bone. Porcelain restorations are then attached to the artificial titanium root after proper healing of the jaw bone. It is also important to remember that not all dental implant restorations are made due to improper oral care or an irresponsible lifestyle! More and more people are being born with congenitally missing teeth, which can cause surrounding teeth to become misaligned, a possible evolutionary trend. Early diagnosis always makes the restoration process easier. Though technology is constantly evolving, and may at one point completely replace the need for artificial dental restorations, it is of the utmost importance to try and take care of what you have! A person's original, natural teeth are always the healthiest and most desirable option.